This is a simple rating system that makes use of domain thresholds. A domain is a cognitive landscape that defines what kind of thoughts an entity can articulate. For instance, non-sentient creatures cannot utter cogito ergo sum, while sentient creatures like humans can. This is because their minds work in fundamentally different ways, especially in the kinds of qualia they can experience. 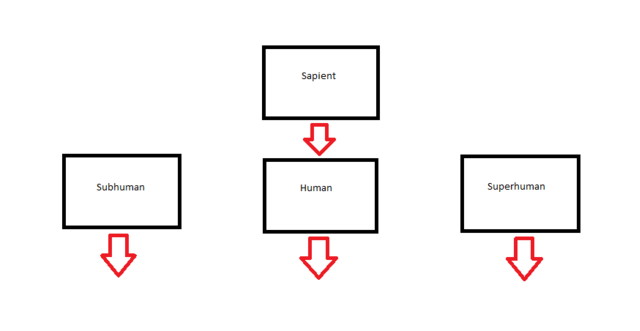 There are at least 3 domains that we know of: Non-sapient, sapient, and transapient. This scale will map out the territory exclusively within the sapient domain. At a minimum, all sapient beings are capable of using language, rationality, abstractness, and numeracy. They are self aware (to a varying degree), have object permanence and theory of mind. 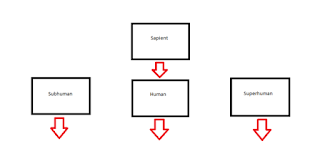 This rating system will work under the assumption that the sapient domain has 3 different tiers, which can be classified as subhuman, human, and superhuman. The reliance on anthropomorphism is a necessary evil: Since humans are the smartest species on planet earth, we set the benchmark on what is cognitively achievable. Of these 3 tiers, each will have a further 3 sub-tiers, which encompass the full range of traits found among sapient beings. Remember that the difference between individuals of the same tier is rather small, while the difference between individuals of different tiers is huge. In the interest of simplicity, this scale will only use fictional characters. -Defining traits: These individuals are dimly self aware (I.E, they can perceive themselves). They are intelligent enough to create societys, and use proto-linguistics. They can coordinate attacks against individuals or small groups, similar to how chimpanzees will chase and funnel monkeys into a trap. But organised mass violence against other large groups (with specific maneuvers) is beyond their ability. -Mid subhuman: Flipper. King Kong. Alien Queen. -High subhuman: Jara-Hamee. Bizarro. The Hulk. -Defining traits: These individuals are fully self aware (I.E, they can perceive their thoughts about themselves). They are intelligent enough to create planetary civilisations, and use linguistics. They have the cognitive skills needed to organise large scale war against other groups, though their inability to account for chaos results in poor execution. -Low human: Peter Griffin. Homer Simpson. Forrest Gump. -Mid human: Most fictional characters. -High human: Elfangor, Aximili. Sherlock Holmes. Peter Parker. Albus Dumbledore. Spock. -Defining traits: These individuals are recursively self aware (I.E, they can perceive their thoughts being perceived by themselves). They are intelligent enough to create solar civilisations, and use auxo-linguistics. They have the cognitive skills needed to organise large scale war against other groups, and turn out perfect performances every time. -Low superhuman: Elfangor, Aximili, when operating the time matrix. Adam. Reed Richards. Leon Greco, 2nd ampule treatment. -Mid superhuman: The Doctor. Admiral Thrawn. Professor X. Leon Greco, 3rd ampule treatment. -High superhuman: The Ellimist, after defeating Father. Brainiac. Dr Manhatten. The Primagen. Leon Greco, 4th ampule treatment. Blue is for characters from the marvel franchise. Red is for characters from the animorphs franchise. Most of the other names on this list are self evident: Those who aren't will have a green link. Leon Greco is the main character from Ted Chiangs novel: Understand. Through progressive surgical treatments with a substance called 'hormone k', he gradually became more and more intelligent. The Primagen is the main villain from Turok 2. He was an explorer from an ancient civilisation (possibly the first born), who built a star ship the size of city. The Primagens voyage opened a rip in space time and created the lost land.